Data for the past twelve months ... using the scoring algorithm from the past twelve months to score prior years as well. Frequency: Orders in past year. 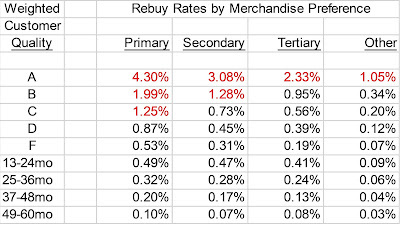 Items per Order: Total annual items (20) divided by total annual orders (4) = 5.00. 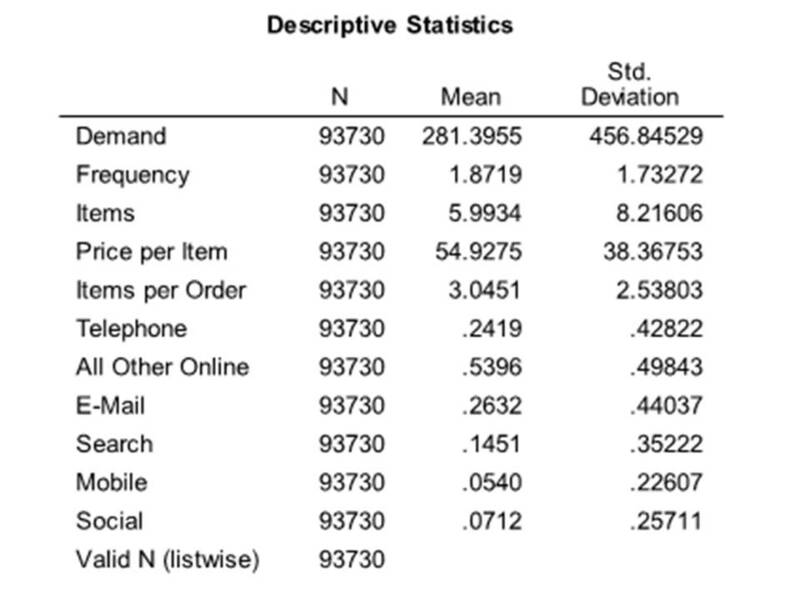 Price per Item: Total annual demand ($800) divided by total annual items (20) = $40.00. 1/0 Indicator: Did customer buy using telephone channel in past year? 1 = yes, 0 = no. 1/0 Indicator: Did customer buy using all other online channels in past year? 1/0 Indicator: Did customer buy using last-click attribution to e-mail in past year? 1/0 Indicator: Did customer buy using last-click attribution to search in past year? 1/0 Indicator: Did customer buy using last-click attribution to social media in past year? 1/0 Indicator: Did customer buy using last-click attribution to mobile in past year? So, we create a dataset that has one year of data, with these attributes. WARNING: The rest of this post gets really "geeky" ... so if you don't like math, move along, there's nothing to see here! 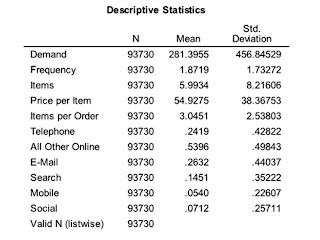 The means and standard deviations are used later, when I want to create each of four factors. 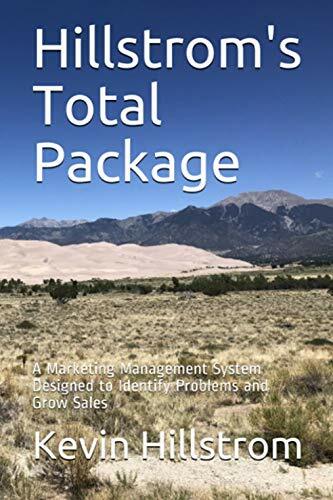 In this analysis, we're looking for metrics with an absolute value greater than 0.20 ... this helps us identify the variables that contribute to each factor. Factor #1 = Frequency, Mobile, and Social. This factor likes loyal customers who have migrated to mobile and social channels. 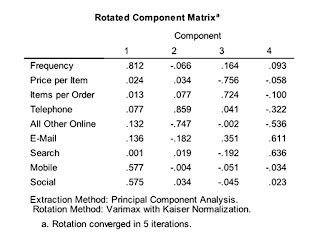 Factor #2 = Telephone, Not Online. 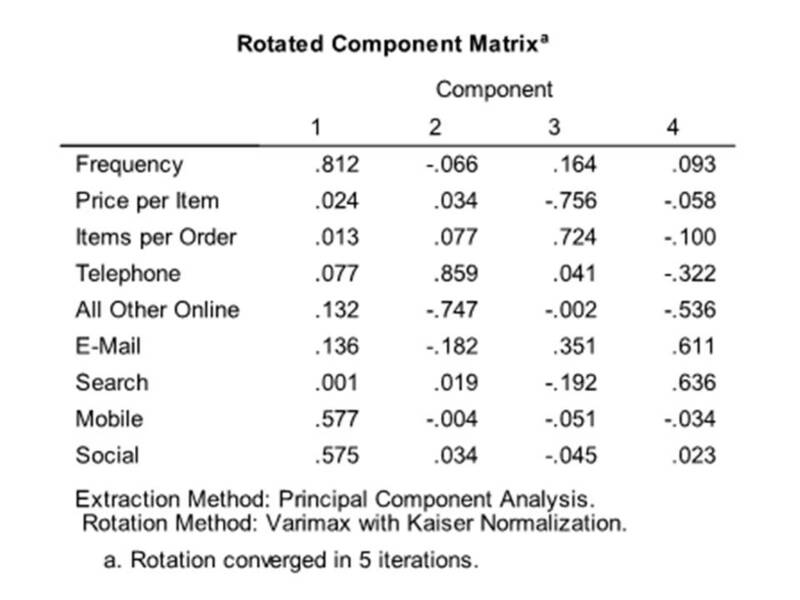 In other words, this factor favors old-school shoppers who call the contact center to place an order. Factor #3 = Many Items per Order, Low Price per Item: These customers like cheap items, and they buy lots of cheap items! Factor #4 = E-Mail + Search: Customers who buy via e-mail and search, not necessarily other online channels, fall into this factor. Kinda makes one wonder if e-mail causes search to happen, doesn't it? Up Next: We'll create sixteen Digital Profiles from the four factors extracted from this analysis.